Whether you’re looking to educate yourself about the latest SEO trends, network for job prospects or just make new friends online, participating in a Twitter Chat is an easy way to do all three, without even leaving the house! Read on to learn more about Twitter Chats and which ones you should be participating in on a weekly basis. Once the chat begins, its host or moderator will post questions for participants to answer. These questions are meant to be open-ended for the purpose of promoting discussion. Given that Twitter Chats typically last an hour, the host will distribute his or her questions evenly throughout the hour for people to share their answers. A typical chat has between eight and ten questions. These chats are designed for people with similar interests to come together and talk about a topic they’re passionate about. In addition to the SEO and marketing niche, there are plenty of chats available on diverse topics, ranging from subjects like healthcare to writing to parenting and more. 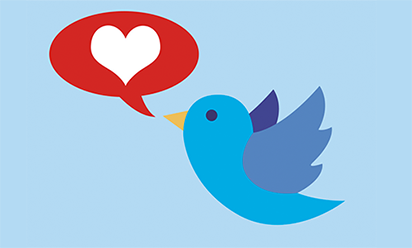 Check out Tweet Reports to find the perfect Twitter Chat for you. How Can I Participate in a Twitter Chat? Step 1. Follow the Moderator’s Twitter AccountSince this is the person who will be posting each question, following him or her will allow you to see each question right on your home feed. Step 2. Always Use the Chat’s Designated HashtagThere will always be a set hashtag to use during a Twitter chat. By incorporating it in every single tweet you post during the hour-long chat, you’re allowing dozens of influencers to find your tweets and even reply to them with their thoughts. Step 3. Begin Chatting!The host of the Twitter Chat will structure their questions by beginning all of their tweets with Q1, Q2, Q3 and so on. Participants should answer with an A1, A2, A3 structure so that the host, and other participants, know which question you’re answering. 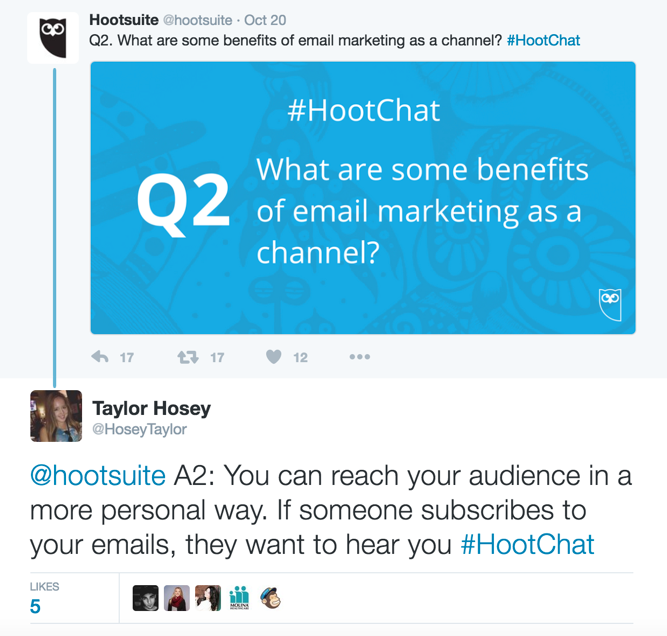 In this example, I responded to the host’s (@Hootsuite) second question with A2 at the beginning of my tweet so that it was clear which question I was addressing. Their hashtag, #HootChat, was also used in both tweets, since both Hootsuite and I wanted to catch the eyes of those aware of the Twitter Chat in progress. Now that you know the basics of Twitter Chats, the following are examples of chats that stand out because of their discussion topics, participant volume, etc. Every week, Hootsuite partners up with an influential expert, with the weekly topic revolving around their expertise. For example, in the chat seen above, they partnered with MailChimp (an email marketing specialist) and focused on the topic of email marketing. This weekly Twitter Chat is for those who own or are a part of a small business. Topics range from acquiring social media leads to converting landing pages and more. Like #HootChat, #CMWorld also partners with experts to discuss key marketing content topics each week. These topics have ranged from employee teamwork to writing tips to web design mistakes worth avoiding. Designed for an international target audience, #BufferChat is a discussion forum that repeats multiple times every week. Guests from influential companies such as EverNote lead the discussion on topics such as content distribution and the future of video. Hosted consistently by social media influencer Pam Moore, #GetRealChat discusses a wide range of topics from blogging to live videos to marketing during the holidays. #SEMRush brings in a different social media guru to lead each weekly chat focused on topics such as SEO, paid search, and video marketing. Unlike other chats, this one revolves only around using Twitter. Personal influencers and small businesses can participate in #TwitterSmarter for tips on engaging with your audience, getting leads from Twitter and more. Want to Be On This List? Let Us Know! If you host a Twitter Chat that’s related to SEO, marketing, or social media and you’d like to be included in our list, reach out to us today and let us know about your expertise!